Officially called The Society for the Development of Alternative Energy, the Mizzou Hydrogen Car Team is an engineering student competition team that designs and builds hydrogen fuel cell cars. 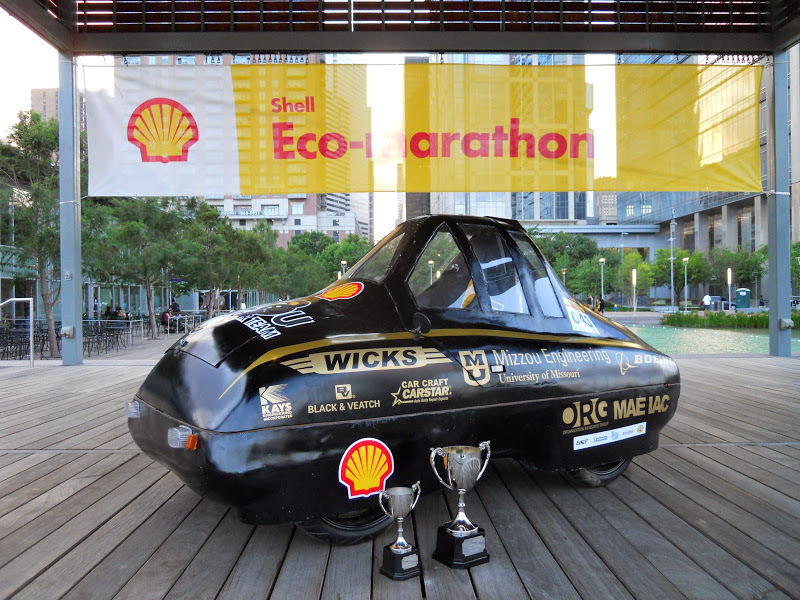 Currently the team is building vehicles to compete in the Shell Eco-Marathon Urban Concept Challenge. The team was originally founded in the early 1990's as a solar car team. In 2005 the team began creating hydrogen fuel cell cars. We have about 30 active members spanning almost all engineering disciplines at the University of Missouri. I served four years as a mechanical engineer on the University of Missouri Hydrogen Car Team. This project has undoubtedly had the greatest impact on my college education. I joined the team as an eager biological engineering freshman with too much time on his hands. I worked with chemical engineers to create the hydrogen fuel delivery system for Tigergen I. My interests in mechanical engineering spurred me to machine a locking device for the fuel regulator and then to machine small components for Tigergen’s suspension. During my sophomore year I volunteered to design the suspension for the next hydrogen car, Tigergen II. I was both excited and nervous about committing to a project that relied on concepts that would not be discussed in my curriculum for another year. I read books about suspension design and analyzed the previous car’s suspension. I learned Pro/ENGINEER as I transformed my hand drawn concepts into solid models. Eventually I needed to collaborate with upperclassmen to adjust the design and perform finite element analysis. While many students were working on perfecting their summer tan, much of my spring break was spent in the basement of Engineering Building West, hammering out the suspension and chassis design with the team's head mechanical engineer, Eric Sawyer. 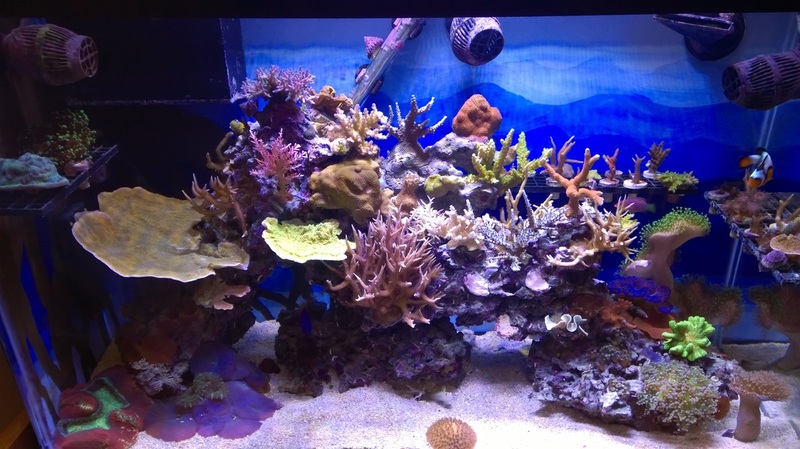 The photo on the left is my 29 gallon coral reef aquarium. It started as a casual DIY project that turned into a passion. Now I nurture over 30 species of coral along with a couple of clown fish, shrimp, a clam, and an anemone. It is an exciting engineering challenge to provide life support to so many creatures that demand precise water and lighting conditions to thrive. Coral require stable Ph, proper salinity, abundant lighting, calcium, trace elements and food to survive. Careful monitoring and consistent maintenance make this possible. I have automated systems to make my life easier. I installed automated pumps to replace water as it evaporates and to add calcium as corals incorporate it into their skeleton. I have digital probes that monitor Ph and temperature connected to a system that can send e-mails when these parameters exceed set limits. While automation has eliminated most daily tasks I still need to do water changes twice a month to help export waste products and replace trace elements. Reef keeping is a great activity if you like to tinker and experiment. There is a lot of potential for new equipment, upgrades to improve water quality, and systems to automate daily maintenance. Discovering what makes different corals flourish is also highly rewarding. Each coral colony has its own preferences for lighting and water circulation. Some need to be fed often while others survive primarily on photosynthesis. When you get it right, the colonies flourish, increasing the beauty of your living work of art. MIT Emergency Medical Services is a student run ambulance service at MIT. We are a fully functioning BLS ambulance service that provides emergency response to the MIT campus and MIT properties in Boston. We transport to many hospitals in the area including Massachusetts General Hospital, Mount Auburn Hospital, and the Cambridge Hospital. I have volunteered over 350 hours responding to emergency calls. This has been one of my most valued experiences while at MIT. Working as a first responder has helped me hone my personal communication skills in a high stress environment. I have also learned how to drive a rather large truck through the narrow streets of Boston. During the MIT course 2.131, Advanced Instrumentation and Measurement, our group was tasked with developing a measurement instrument. Our group decided to create a tool to aid in diagnosing vestibular (inner-ear) disorders. Our primary goal was to measure changes in the vestibulo-ocular reflex (VOR), a reflex that links eye moment to movements of the head. The input to our system was an actuated pillow that rocks the head to send a stochastic motion signal to the inner ear. 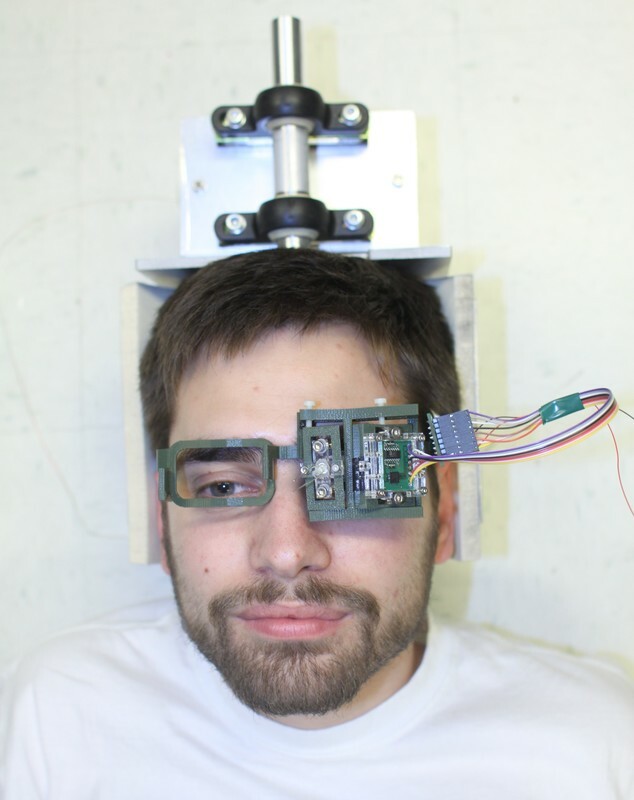 Our eye tracking device would then measure the response to eye moment. The signal was then processed to determine the transfer function of the VOR. Changes in this transfer function could be used as a tool to gain information about balance disorders. I worked on the head actuation component, creating a control moment gyroscope actuator prototype and the Lorentz force actuator we used in the final design. The team became semi-finalists in the MIT 100K accelerate competition. In the spring of 2014 I competed in the Global Space Balloon Challenge with a team at MIT led by Duncan Miller. The purpose of the competition was to get people excided about science, technology, innovation, and of course, space balloons. Our team used the opportunity to raise donations for cancer research at the Massachusetts General Hospital Pediatric Cancer Center. In the end our endeavor raised over $1,300 dollars in donations for cancer research. We also delivered mission patch stickers that we flew in our balloon and gifted them to the children in the pediatric cancer center. You can read more about the space balloon challenge in the articles below. Orthopedic surgeons often repair large fractured bones by intramedullary (IM) nailing. In the current procedure, an incision is made at one end of the long bone and a titanium rod is inserted through the medullary cavity, which is also called the marrow space. The purpose of this surgery is to stabilize the bone so it can heal properly and to reduce the risk of infection by avoiding making an incision close to the fracture site. Traditional methods for insertion or removal of the IM nail requires the use of a slide hammer to drive the nail. During the operation there is a risk of introducing an additional fracture during the insertion procedure. These fractions may be because of the impulse applied by the slide hammer and poor technique. I worked with two partners on a capstone project to design and build a device that decreases the probability of surgery induced fractures by replacing the slide hammer with a powered insertion tool. 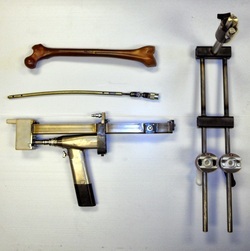 Previous capstone groups had created early prototypes of a device that is powered by the same surgical reamer used during the standard procedure. I learned from their concepts to help design and build the final device shown here. We began the engineering analysis from the ground up to inform the final design. First we developed the broad engineering design constraints such as safety, cost, and manufacturability. We elaborated on the design constraints, and performance goals to create a Quality Function Deployment (QFD) chart to identify the most important areas to focus on for our design. Next concepts were created and designed developed. We created a Failure Mode Effect Analysis (FMEA) of the design by giving numerical values for the estimated severity and frequency of failure of several parts of our design. We built the final product in the machine shop and 3D printed the cover for the bone contact and sprocket cover. A Stryker 2104 Surgical Reamer powered the sprocket which turned a linear ball screw. The nail was attached to the ball screw carriage with a quick release mechanism. The device anchors to the surgical table with a ball joint connected steel support stand. This prevents the device from slipping backwards while still giving the surgeon the ability to adjust the insertion angle of the IM nail. The final product was functional, but we did not have any time to test it in any simulated environments. The next step would be to verify the insertion forces generated and to test the device in a surgical training setting such as the Mizzou pig laboratory. One of my major research projects at the University of Missouri was to develop molecularly imprinted polymer (MIP) biosensors to detect paraquat dichloride, a common herbicide, in watersheds. MIP sensors are biologically inspired substrates or particles designed to isolate a specific molecule. Similar to the "lock and key" mechanism of an enzyme, MIPs rely on spatial conformation and molecular interactions to bind to a specific molecule. Once the analyte is isolated by a MIP, various methods can be employed to detect and quantify the amount of the target chemical. In my research I utilize fluorescent tags called quantum dots to quantify the amount of analyte by observing a fluorescent quenching response using a spectrofluorometer. Simply stated, the less the sample glows, the more analyte is present. A MIP is formed by mixing a solution of functional monomers and the molecule that the MIP is designed to isolate, also known as the template molecule. The monomers are then polymerized and template molecules are captured within the polymer matrix. The polymer is then heated or exposed to a solvent to remove the template molecule. This process leaves behind an impression, or imprint, of the template molecule in the polymer matrix. The selectivity of a MIP is a result of the conformational impression and non-covalent interactions between the target molecule and polymer functional groups. The final step is to tag the MIPs with fluorescent molecules. When a target molecule binds to the MIP it will be in close enough proximity to the fluorescent molecules to produce a response.